It’s been two months since I came back from my 200-hour Vinyasa + Ashtanga yoga teacher training in India at The Rishikesh Vinyasa Yoga School, and the question I’ve been getting from everyone is “How was it!? 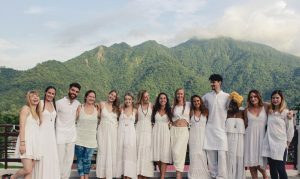 Tell me all about it” But how the hell do I summarize 30 days of yoga, laughing, crying, dancing, singing, sweating, learning, practicing, teaching and discovering in one sentence? It was learning how to breathe and meditate and sit still for an hour. It was being a sweaty, dirty mess for a month, but not caring how I look. It was getting weird rashes and allergies all over my body and not knowing what’s going on. It was dancing like no one’s watching and singing my lungs out to Indian Bollywood songs and mantras. It was being surrounded by incredibly inspiring and uplifting people, and both laughing and crying together. It was getting to know the Indian culture and falling in love with their generosity. And falling in love with myself again. 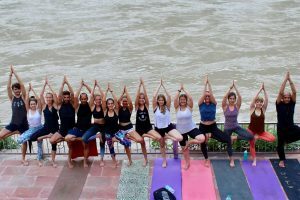 It was feeling deflated on days where the yoga flow just didn’t seem to happen, and feeling elated when a challenging pose finally seemed in reach. It was lying in bed at night wondering what my purpose in life is. It was allowing myself to be more vulnerable than ever before. It was realizing that everything is OK. It was realizing that things are coming full circle for me and that I truly feel at peace with myself. In other words, it was everything I hoped for and more and I couldn’t be more grateful for the incredible experience that I had. I never did the training with the intention of becoming a teacher myself, but rather saw it as a learning and growing opportunity for myself. And boy did this experience push me out of my comfort zone. I’ve worked so much on myself, from my posture to my down dog to how I cope with uncomfortable situations. All in all, it was a humbling experience and I’m incredibly grateful that I had the chance to experience it. As you can see, the schedule is pretty full on. 3 ½ hours of yoga a day, 3 lectures, meditation, studying, practicing; the day is jam-packed. No wonder we were in bed by 9pm most days. The yoga flows get harder week by week, and it’s incredible to watch how quickly your body responds to the practice. See pictures below for some unashamed before/after pictures. Pretty impressive, huh? Another question I get a lot is if I recommend going to India. Let me say this - I am so glad that I went for a fully immersive YTT and didn’t do it here at home spread out over a couple of months. Your yoga practice might improve the same way, but I don’t think you get the same spiritual experience as if you go straight to the source. And as that’s what I was after, going to India was perfect for me, but that’s just my own 2 cents. The third question I always hear is « What did you learn, apart from the physical practice ? » And I think this is where the true goodness lies. Having had a bit of time between my experience and now, I come to realise that it has actually changed me in more ways than I thought it would. I guess some of the lessons I learnt took a little longer to sink in, but now that I’ve settled back into a routine at home, I notice how things are different. 1. Celebrate the small victories – I rocked up on the first day declaring that my goal was to be able to do the splits. But as the days progressed, I realized that this was a highly unrealistic goal and that I should maybe focus on smaller, more realistic changes. And I was actually noticing a lot of changes already – looser hamstrings, better forward folds, calmer Pranayama, stronger chaturanga. Had I insisted on achieving my “dream goal” of splits, I’d probably would have been frustrated with myself every day. But I made the conscious decision to focus all my energy on the subtle changes I was noticing, and as a result I went to bed every night feeling accomplished and proud of myself. 2. Expectations ruin everything – whether it’s relationships, work, life goals, expectations can rob you of all life joy. It’s fine when things are going well, but when they’re not, it’s easy to start pointing fingers at others. Most people came to YTT with certain expectations, and when they weren’t met, there was lots of resistance, grumpiness and frustration (for those who’ve done YTT themselves, holy moly is week 3 a rough one where emotions go crazy or what!?). I had made the active effort to go into YTT without attaching too many expectations to it, so when everyone else seemed to hit that week 3 wall of frustration, I stayed cool, calm and collected and wasn’t effected by it as much as everyone else. 3. Sit in stillness to build resilience – when you practice being still, it has the potential to create a deeper connection with yourself. Being in stillness and silence, be it a through restorative yin practice, pranayama or meditation, brings awareness to your inner world and maybe you start to notice uncomfortable icky stuff that you didn’t even notice existed. It’s when we sit with the uncomfortable rather than run away from it, that we build resilience and learn that we are strong enough to deal with whatever may come our way. To me, this is one of the most transferable mat-to-daily-life lessons, because it has taught me that I am stronger than I think I am. 4. An overwhelming sense of gratitude – when you shower out of a tap and sleep on a bed as hard as bricks for an entire month, you betcha that you will be incredibly grateful for your warm-water rain forest shower and clean white bed sheets. Gratitude is not something that comes very easy to me, but ever since coming back to India I’ve been overwhelmed with a sense of gratitude like I’ve never experienced before. Gratitude for this journey, for this life, for freaking being alive and for what incredible things my body can do. I could go on and on about what else I learnt, but ultimately I can say this – go do it yourself and watch your life transform. Everything I read about YTT beforehand I went sounded so cliché – “Oh it will change your life bla bla bla…” , but looking back at it now I can say that it’s true. Wow, this resonates with me more than 100%. I would immediately pack my bag and go for it. I so much would love to do that. But the thing I am struggeling with is how to cope with my true desires and the pull that I feel strongly from my heart and my family life. I have 2 kids and a full time working husband and cannot just leave them and do what my heart wants me to do. I have responsibilities, and although I really love my family sometimes I feel like they hold me back. Does anyone experience the same? How do you deal with such situations? I loved learning this about you! What an amazing experience.